Fill a large saucepan with water, cover with a lid and place over a medium-high heat to bring to the boil. While the water heats up, put the olive oil, onion, garlic and chilli into a large frying pan and place it over a low to medium heat for 5 minutes, then add the pancetta. Cook for a further 5 minutes. Once the water comes to the boil, add the spaghetti and set atimer for 10 minutes. Stir the spaghetti every few minutes to prevent it from sticking together. With 3 minutes left before the spaghetti is cooked, whisk together the egg yolks, Parmigiano Reggiano and a ladle of the spaghetti cooking water. 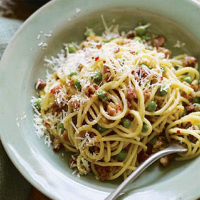 With 1 minute to go before the pasta is cooked, take the pancetta and onions off the heat and add the frozen peas. Strain the pasta and return it to the saucepan. Add the contents of the frying pan and mix together. Add the black pepper and the egg and cheese mixture and allow to sit for 2 minutes. Stir thoroughly to incorporate everything then serve with some grated Parmigiano Reggiano sprinkled on top. Eggs: All eggs should be thoroughly cooked. For the latest guidelines, visit foodstandards.gov.uk. Recipes containing semi-cooked or raw egg are not suitable for pregnant women, elderly people, or those with weak immune systems. This recipe was first published in Wed Sep 01 01:00:00 BST 2010.